This month, PLoS ONE published a new research study that I think will interest readers of The Genetic Link. The study, titled "Array-Based Whole-Genome Survey of Dog Saliva DNA Yields High Quality SNP Data", was written by Jennifer S. Yokoyama, Carolyn A. Erdman and Steven P. Hamilton of the Department of Psychiatry and Institute for Human Genetics, at the University of California, San Francisco. The study is interesting for several reasons. The study highlights the availability of array-based genotyping platforms for canines but notes that they require large quantities of high quality genomic DNA. The authors state that there is an increasing demand in the research and clinical communities for larger sample studies to ensure statistical significance. The study notes that DNA sampling can become the limiting factor when studying canine behavioural traits. The authors evaluate the performance of whole blood and Oragene•ANIMAL DNA collection kits for GWAS studies. DNA from all samples was analyzed using Illumina's Infinium Canine SNP20 genotyping array. The researchers' experience suggested that owners were more conducive to returning Oragene•ANIMAL kits than to agree to a blood sample. Surveys sent out with the kits also indicated that the owners found the collection to be very easy. The sample collection was successful for all participants and the process took less than 10 minutes. 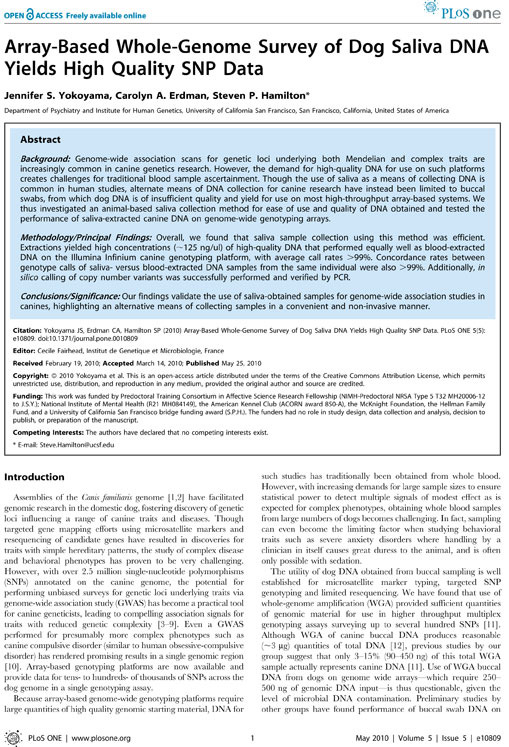 High-throughput whole genome array genotyping was performed with outstanding results. The samples achieved very high overall genotype call rates (>99.5%) with very good concordance. They found that on average, genotypes from DNA derived from blood and saliva from a single dog matched >99.9% of the time*. The researchers found the Oragene•ANIMAL DNA collection kits very favourable due to their ease-of-use and non-invasive approach, making them a preferred method of sample collection for future studies. 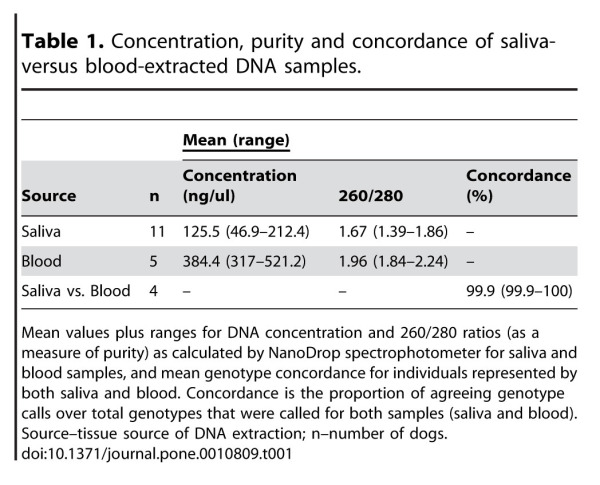 According to the researchers: "Our results demonstrate that saliva collection from dogs is facile, convenient, and yields large amounts of high quality DNA that provide excellent performance on high-throughput whole genome arrays." With Oragene•ANIMAL, researchers will be able to collect the number of samples required for GWAS studies and they can be confident of the quality and quantity of the DNA and its performance for array-based studies.